The Youngstown State men's basketball team continues its postseason run when it hosts Canisius, Saturday, March 23, in the second round of the CollegeInsider.com Postseason Tournament. • Tipoff is set for 7:05 p.m. EST at the Beeghly Center and the game can be heard on 570 WKBN-AM and iHeartRadio. • The Penguins won the first Division I postseason tournament game in program history after knocking off Oakland, 99-87, in the CIT first round on March 19. • The Penguins set a school single-game record with 18 3-pointers against Oakland. • Junior Kendrick Perry scored a game-high 31 points and made a career-high six 3-pointers. • Senior Blake Allen tied a pair of career highs with 27 points and seven 3-pointers. • Allen also became the 35th YSU player to reach 1,000 career points. • Junior Kamren Belin scored 16 points and made three 3's. • Senior Damian Eargle recorded a double-double with 12 points and 10 rebounds. • Freshman Bobby Hain scored 11 points off the bench. • This is just the fourth meeting between the Penguins and Golden Griffins in a series that dates back to 1941. • Canisius won all three previous games, the last one a 71-59 at the Beeghly Center on Nov. 26, 2006. • Canisius, who has recorded a 14-win improvement from 2011-12, finished fifth in the Metro Atlantic Athletic Conference with an 11-7 record in and its 19 wins are the most since the 2000-01 season. • The Griffs' 11 conference victories were the most since the 1998-99 campaign. 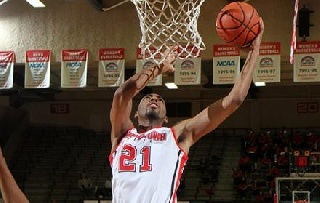 • Improve YSU to 19-15 overall and mark YSU's first 19-win season since 2000-01. • Mark YSU's first win over Canisius. • Mark YSU's second postseason tournament win in the school's Division I history. • Mark YSU's 13th win at home this season. • Mark Head Coach Jerry Slocum's 674th career victory and his 93rd at Youngstown State. • Mark YSU's 1,027th victory in the program's history. •Senior Blake Allen became the 35th player in Youngstown State men's basketball history to score 1,000 career points when he tied a career high with 27 against Oakland on March 19. • Allen, the school's all-time 3-point leader with 225, also matched a career-best seven 3-pointers in the 99-87 win over the Golden Grizzlies. • The Penguins set a new single-game 3-point record against Oakland, nailing 18 from behind the arc and breaking the former record of 14. • The Penguins were also just two shy of tying the Horizon League record. EKU (25-9) at Evansville (19-14) 1:30 p.m.
Rider (19-14) at East Carolina (19-12) 5 p.m.
Canisius (19-13) at YSU (18-15) 7:05 p.m.
UIC (18-15) at UNI (19-14) 8 p.m.
Air Force (18-13) at Weber State (27-6) 9 p.m.
Kent State (21-13) at Loyola MD (22-11) 3 p.m.
UC-Irvine (21-15) at Oral Roberts (19-14) 8 p.m.
• After missing four and coming off the bench in his first game back, junior Kendrick Perry made his return to the starting lineup against Oakland on March 19. • Perry scored a game-high 31 points with eight rebounds and five assists. • He also made a career-high six 3-pointers against the Grizzlies. • Youngstown State has scored 2,344 points this season and needs just 45 more to break the program's single-season scoring record. • It marks the fourth straight year it has scored at least 2,000 points in a season. • That point total is also the highest since the Penguins set a school record with 2,388 points in 1990-91. • It's also the fifth time in the last eight years the Penguins has surpassed the 2,000-point mark. • The Penguins are also averaging 71 points per game, the most since 71.1 ppg in the 2000-01 season. • The last time the Penguins averaged at least 70 points per game was in 2000-01. • The win over Oakland on March 19 marked the Penguins 12th win at home this season. • It's the most wins since the 1984-85 team won 12. • The school mark for most wins at the Beeghly Center is 17, set in 1976-77. • Over the last two years, the Penguins own a 22-8 home record for a winning percentage of .733.